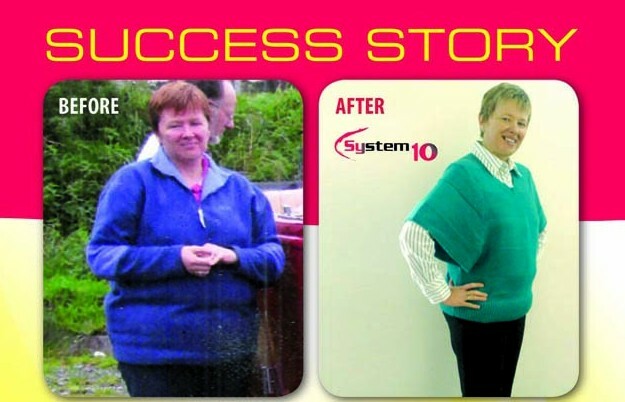 System10 has helped Bridget O’Neill achieve her weight loss goals. I started System10 in February 2009 an a last bid attempt to lose weight for my daughters wedding which was in May 2009. After 10 weeks I had lost 2 stone*. I just couldn’t believe it I had more energy and feeling so well I was quite pleased with myself and had no plans to lose anymore. And then suddenly I thought ‘I can do this’ and decided to go on another 12 week plan. By July 10th I was down 13 stone 6 lbs! 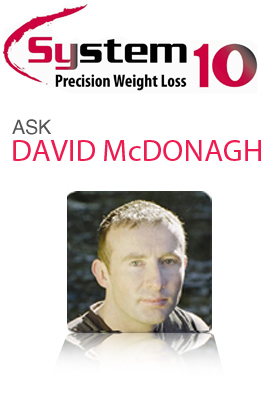 *Disclaimer: Where weight loss is mentioned, figures are only indications of possible weight loss. Results are subject to physical, mental and motivational factors. My doctor was amazed at the improvement in my blood pressure and my nagging hip pain was gone. I then believed I was going to achieve my goal weight of 11 stone. I was very determined , I continued my food plans and my gym workouts at figure8 and now in November I have nearly reached where I want to be. I love shopping now something I really hated before I have more confidence than I have ever had before. System10 is the best plan I have ever done. It is motivational and I have learned an awful lot about how you really lose weight, by fixing your metabolism, eating normal foods without cravings or hunger. System10 has changed my life with the help of the girls at figure8. It has been the best 10 months for me and I’m not quite finished yet.